Can you imagine the shabbat table or the medura/campfire without Jewish music? Jewish music is a huge draw, perhaps second only to exceptional Jewish food, and programs with Jewish music appeal not only to listeners, but to many who play, sing, or sometimes take the lead. Nearly one-third of San Diego’s more than 30 indie Jewish experiences involve Jewish music. Not just a concert, but an activity where you can contribute to, sing, or play Jewish music. While most are for adults at least two focus on teens. The Teen Songleader Fellowship and Hazamir San Diego give teens an opportunity to lead using their musical skills in Jewish settings. 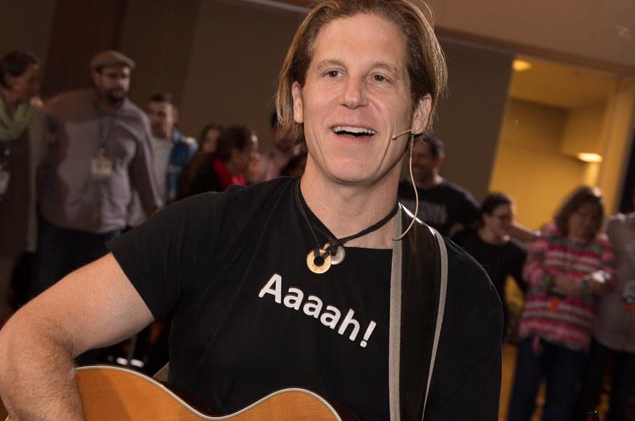 Rick Recht began his Song Leader Boot Camps (SLBC) to inspire anyone who can hum, sing and/or play an instrument to create magic Jewish moments and he will offer a regional SLBC in San Diego March 31, at the Hive in Encinitas, San Diego’s coworking space which focuses on professional growth and Jewish cultural events. Rick is the spokesman for the PJ Library, founder of Jewish Rock Radio, and offers concerts and workshops nationwide and in Mexico too. San Diego’s regional SLBC is for adults and teens. Leveraging a wide repertoire of music, you will expand your knowledge of classic and contemporary Jewish music with local friends and musicians. Bring your voice, your instrument, your energy. The workshop runs from 9:00 a.m. – 3:30 p.m. and is rich in Jewish music and singing. Israeli music is magic, it unifies, can be peacemaking, bridges generations, Israel and the diaspora, and enriches Jewish identity and Israel connection. Shirock was founded and is led by local music lovers and musicians Amir Tsuri, Ronit Yerushalmi and Noa Scott. Audiences are encouraged to make song suggestions and the audience rocks the room singing with them making it less concert and more a rock-infused sing along. The talented tribe offers Shirock under the umbrella of RocXan Diego. They shared, “RocXanDiego believes that rock is more than a music genre, it’s a being, a way of life of rebellious against conformity, authenticity and conviction. We dedicate ourselves to serve the local community in San Diego and various groups and organizations in order to advance the knowledge and appreciation of Israel culture through rock music.” February’s Shirock sold out in two days, so watch for the next one on their Facebook. And learn more at tarbuton.org/2019/01/21/shirock/. Cheri Weiss founded the San Diego Jewish Community Choir. If you enjoy singing Jewish music, no need for experience, just join in rehearsals held three Wednesdays per month. Rehearsals begin with a brief voice lesson. Cantor. Learn more at tarbuton.org/2018/09/10/san-diego-jewish-community-choir/. Recruiting now and planning to open with the 2019-2020 school year is Aviva Angel’s initiative to open Hazamir San Diego, a chapter of Hazamir, the International Teen Choir that offers college credit and includes a unique joint performance with other chapters in NYC at Lincoln Center or the Met. Aviva tapped local artist, and accomplished music educator, Becky Baird to direct the choir. Aviva commented, “We want our kids to learn incredible Jewish music, but this program has great motivators such as opportunities to travel to NYC, Israel, be a part of a select Chamber program, and college credits too. All that and they have a blast as well.” Songs are primarily in Hebrew, but teens don’t need to speak Hebrew or read music to participate. The choir is open to all Jewish teens in San Diego. Learn more at tarbuton.org/2018/12/23/hazamir-teen-choir/. Tarbuton supports independent Jewish and Israeli community builders creating new entry points for Jewish life in San Diego. Browse these and 30+ Jewish experiences at our web site: https://tarbuton.org/san-diego-jewish-experiences/.